Just read an article about blogging and it suggested that a successful blog should have guest bloggers. It also suggested that I should occasionally give things away. So I'm interviewing guest bloggers who will offer free advice, gifts or secrets of success. I guess I could just give things away and pretend to be someone else like I do when I'm writing. So, I guess if I start featuring guest bloggers you won't know if it's me or really a guest blogger. Anyone interested in being interviewed about the old days of South Beach? (years 1990-1999). Let me know. 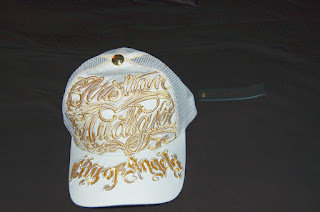 I'll announce the first guest blogger tomorrow and later this week offer my first giveaway (a white Christian Audigier City of Angels cap). Now back to writing LAUREL AVENUE. I've already changed the beginning and two of the characters. Today I'm also working on rewriting my life, one day at a time. Leave a comment if you want to be a guest blogger, interviewed or want this great cap. No one seems to want this cap.